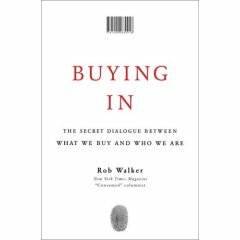 Book Review: Buying In by Rob Walker. Last Friday morning, I stopped by Likemind to see Piers, Noah and others, as well as to pick up an advanced copy of the book “Buying In” by Rob Walker. His publisher, Random House, offered Likemind attendees in North America free copies and kindly paid our coffee bill too. Walker is a journalist who covers marketing and consumerism for the New York Times. The book attempts to explain why we prefer certain brands, for seemingly irrational reasons. His theory is that we have a deep relationship and dialogue with the products we consume. More importantly, we use these products to create our own self-perceived identity and they give meaning back to us. Changes in marketing strategies have made the relationship even more complex, as the traditional modes of advertising such as mass television and print ads give way to the untraditional methods of “viral” or “guerrilla” marketing. The shift blurs the differentiation between marketers and consumers. Many of the cases he covers will be familiar– Pabst Blue Ribbon, Red Bull, Timberland, American Apparel, and of course Apple’s iPod– especially if you read Walker’s column “Consumed” in the New York Times Magazine. The idea works like this: we buy into brands and their products mainly in order to a tell a story about ourselves to ourselves, not just to other people. Many successful brands are a blank slate, onto which people can project various stories. These multiple meanings allow certain brands to grow beyond their initial niche. Messages from marketers as well as peers shape our perception of what a brand means. Things get interesting when Walker explains how, although we believe that we can see through marketing and branding, exposure to external messages (that is, marketing) can affect not only our perception of quality but the *actual* quality of a product. He cites an extremely interesting study by Dan Ariely, Baba Shiv, and Ziv Carmon, which gave a group of students an energy drink, its true full price, and told them a scientific study showed that the drink helped mental performance. These students did better than students who were given only the test. Surprisingly, other students who given various combinations of getting the drink, being told it was cheaper (and therefore less valuable,) and that the drink “might” improve performance all did measurably *worse* than the control group. The relationship between our identity and our brands become apparent when we look at two human drivers that Walker mentions, wanting to be an individual and wanting to belong to a community. The two seemingly opposing internal motivations work out in fascinating ways. We buy products that conform to what we perceive to be our individual taste. However, our unconscious minds process and react to much more than our conscious minds detects. My point is not to argue that we are victims of subliminal “buy popcorn” images in movies. Rather, people are complex beings, full of, emotions, gut instincts, competitiveness and irrational thoughts. If we were truly rational beings economists could more easily explain our behavior, and everybody would be saving more, eating healthy, and exercising a few times a week. Further, the “truth” that we bestow onto our brands is relative. The actual “truth” about the brand is secondary to our perceived brand identity. As Walker notes, anti-marketing hipsters can drink a “working class” beer like FBR, when in fact, it is increasingly drunk by hipsters and less by mid-Western working class beer drinkers. Walker also describes how the lines between marketer and consumer are blurring, as I previously mentioned. As with most business books these days, he coins a new term for this observed phenomenon, in this case “murketing.” He goes on to describe how new marketing companies hire “agents” to push products onto friends, family, local store owners, and strangers. The key insight here, is that the agents often do this for free, because they like the feeling of empowerment from sharing their ahead of the curve knowledge about upcoming products to people. What is also interesting is that many of the agents aren’t the hipster influencers in the Lower East Side that Malcolm Gladwell describes in “The Tipping Point” or as Walker names as “Magic People.” Instead, they are regular people with regular jobs, living pretty much anywhere. This idea of weak links and how influence spread through them deserves a post of its own. Often, people make the claim that people are in control over their decisions, and are further aided today by having overwhelming access to consumer product and service information. This is true, but the issue is more complicated than that. In the past, my general reaction was that this idea, while true, is only part of the equation. We need to insure that our society supports media literacy for people to have the tools to properly deconstruct all the marketing we increasingly exposed to seeing and hearing. Now, Walker’s research suggests that media literacy is not enough. “Buying In” is mostly descriptive, rather than normative. Walker doesn’t go out and definitely argue that murketing is itself bad, and acknowledges that he too is influenced by these forces at play. He cites his personal questioning of his allegiance to Converse sneakers as an authentic anti-establishment choice after it was purchased by Nike. He does starts this exploration some of the ethics behind our brand-based identities in his coverage of Etsy and craft culture. The founder of Etsy, Robert Kalin, states that his mission is to create authentic “connections” with the things we own. I saw him speak at the recent PFSK conference and was interested to hear him talk about wanting to move towards away from big box shopping and towards a more authentic bazaar-like experience. Walker reports that Kalin has the goal of having his entire wardrobe be hand made products from his site. While this is a noble goal, it does not attempt to unbundle our identities from our brands, be it an artisan on Etsy or the Gap. I would have liked to see Walker take his ideas further in a more normative direction, and explore the possibilities of walking away from our brand attachments. What would happen if we unplugged from our brands? How would we and those around us react to separating ourselves from our possessions? Is that even possible? Even better, what stories would we construct about ourselves? Who would we be? This entry was posted in book, culture, review. Bookmark the permalink. 5 Responses to Book Review: Buying In by Rob Walker. I think we should only choose the brands that are the most socially responsible. That would cut through all the murketing! Instead of being influenced by a neo-Vance Packard-ian “hidden persuader,” one could just choose the stuff from the most responsible company. That’s an interesting option, however, I don’t think the metrics of social responsibility exist for a scalable solution. Also, will social responsibility just become another flavor of the current dialogue between our brands and our identities? How do you we become something more than our stuff?